History has repeated itself once again. The Communist party has crawled out of it's hole to use the antiwar movement as an engine to promote the overthrow of the Capitalist system and replace it with the Commie agenda. We saw this in the Vietnam War protests against a war we were fighting in Asia against the commies. Thus was born the slang for hippies protesters of the time as being "Commie Pinko Fags". The late 60s was the time of the baby-boomers first baby steps out of the family nest on there own into the countrys aging population that they were outnumbering. A small percentage chose to protest whatever they could find that was the status quo. Most of what was protested is now being run by the same boomers and are even more conservative than during the peace and love days of tie dyes and acid trips. One thing that remains a constant is the pride many boomers have in their success in protesting the Vietnam War. the stoner hippie protester mindset and the Nam vets that were spit on and called baby killers upon returning from the war that most were forced to fight against their will. Hanoi Jane and Paper Cut Kerry were typical of the protest era mouth pieces that encouraged the death and defeat of the US soldiers in the jungle while meeting with enemy leaders to further their cause. "The end justifies the means" agenda caused the deaths of countless American soldiers and millions of American allies and their families left behind after the time tabled retreat. Most Baby Boomers still get misty eyed at the mere mention of the effect the war protest had on the politics of the time. Although the mention of the killing fields in Cambodia and the mass graves of Vietnam as a direct result of the time table pullout generally is met with empty stares of denial. The pull out forced by their protests resulted in the execution of as much as 35% of the population that we turned our backs on and walked away. This action was a turning point in the worlds view of the American muscle. The despots of the world learned that to win a war against the US doesnt take a large army, Just enough guerillas to bloody our nose and a good PR team here within our country to whip up public opinion. The enemies of our state have learned that the bleeding heart liberals can have documentation in hand showing the enemy combatants are trained to lie and cry torture when captured and the fools will still believe the prisoners claims. It doesnt matter that the journalists video of Gitmo repeatedly show prisoners putting down their meals at the sight of the media to scream they have not been fed in weeks and are being tortured. In the mold of Jane Fondas treasonous actions of the past the truth and reality is ignored by the liberal retro-hippie crybabies. Now we once again have the antiwar rallies openly sponsored by the Communist party. The rallies are organized by and over run with people handing out anti-American literature and the hammer and sickle is prominent on the large red flags and printed on shirts and banners throughout the protests. This is of no concern to the small group of over the hill retro-hippie Baby Boomers who are rallying in a self-gratifying attempt to relive the lost youth of the 60s. Many Boomers are still stuck on the notion that the world revolves around them. Once again a small handful from the generation of over self-indulgence is acting like a spoiled only child and holding their collective breath until they turn blue in a temper tantrum aimed at getting noticed one last time before being carted off to the old folks home and fed soft food. None of these hippie come latelies give a damn about the millions that lost their lives due to the first spoiled American brat hissie fit and are fully willing to repeat that mistake again just to remind everyone that the Boomers are the golden generation and their asses will be kisses or else. No matter how many millions die to make their point this time around either. The difference now is the lack of a draft. In the Vietnam war it was easier to rally support from parents whos sons were taken to war against their will by the Government. Now we have an all volunteer military and parents that are proud of the children standing up for what they believe in. This is why the rallies have been for the large part just small gatherings of Commies and the AARP tie-dye and geritol crowd. The old people are there to convince themselves they are still relevant in the world today. 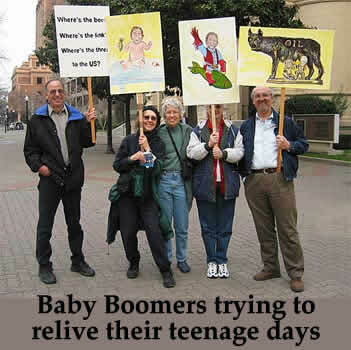 One last hooorah before the spark goes out and the Boomer generation is just a footnote in the history books. Its not about the war. Its about them. Its the legacy of the protesters of the 60s and their lack of vision that created the Paper Tiger system of politics that gave us our Blackhawk Down style cut and run limp wrested foreign policy. The spoiled brat me me me mentality of the Boomers will never catch up with the reality of the grown up world around them. They dont realize the world wasn't one big scene from American Graffiti and the problems we are having today are a direct result from decisions made on the heels of the Vietnam protests. We are doomed to repeat history and millions of Iraqi families will be lined up and beaten to death just like the three million souls executed by hammer and sharpened bamboo sticks in the killing fields of Cambodia. The world doesnt scorn us because of our actions. The world scorns us because of our lack of resolve to finish what we start and back up our promises with action. The Paper Tiger world policies of the US is a direct result of the self-centered Baby Boomer generations inability to see beyond their own needs to be heard. Regardless of whether we should be in the war or not, there is a right way and a wrong way to get out . The US has used the pre-announced time tabled exit strategy ever since the devastation it caused in Southeast Asia and the results have always been the same. Once we pack up and leave the bad guys move in, fill our void and the mass murders begin. Unless the mass graves filling with massacred families interfere with American Idol time slot the public wont care and the aging retro-hippie peaceniks will be high-fiving while dancing to the oldies and touting how they changed the world again. Bush 1 made the insinuation that we would back an internal coup by the Iraqis and then left the empowered freedom fighters to there own fate and executions. Bush 2 doesnt want to repeat the mistake his father made by not walking the talk. We as a nation have to learn to pick our battles more carefully and once we are up to our armpits in defending the American lifestyle to act with dignity and pride. If we want the world to respect us we have to learn to respect ourselves.